Yeah, we know you probably swore off Eggs Benedict a long time ago. Along with onion rings. And fries. And Fettuccine Alfredo. But life isn't fun without great, decadent food. 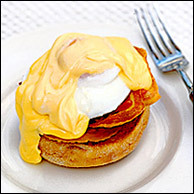 So tomorrow morning, treat yourself to HG's Eggs Bene-chick. Prepare sauce by stirring to combine B&B spread, mayo, yogurt and Dijonnaise; set aside. Crack egg gently into a small cup or dish. Fill a medium-sized pot with 2 inches of water, and bring water to a boil. Once boiling, lower temperature until a steady and consistent, but VERY low, boil is reached. Gently pour in the egg and allow to cook for 3 - 5 minutes (3 for a runnier egg, 5 for very firm), or until egg white is mostly opaque. Carefully remove egg by sliding a spatula underneath it and placing it on a plate. Use a paper towel to soak up any excess water. Toast muffin half and heat ham if desired. Heat sauce in the microwave for approximately 20 seconds and stir (add a little water if you prefer a thinner sauce). Top muffin with ham and egg, and then cover with sauce. Enjoy! Serves 1. For those of you who aren't familiar with it, Eggs Benedict consists of a beauteous poached egg on a crusty english muffin topped with warm canadian bacon (aka ham), all smothered in rich, creamy hollandaise sauce. While almost too delicious to imagine, it's not worth the scary-high fat and calorie counts. FYI -- most restaurants serve up a nearly 1,000-cal double portion of this fatty b-fast meal. Luckily, there's a cure for this insanity: HG's very own Eggs Bene-chick. Yes!!! **Nutritionals calculated using brand names specified. Exact numbers may vary with use of other products. Tomorrow, April 18th, is National Animal Crackers Day. Celebrate with some Snackimals (made by Barbara's Bakery). They ROCK! Share this delicious breakfast recipe with everyone you know. Click "send to a friend" NOW!